nucleation and growth based on the assessment of material damage accumulation. The suggested simulation scheme takes into account the heterogeneity of the material fatigue resistance, the closure effect and elastic-plastic material response. The proposed technique considers the crack initiation phase and allows performing crack growth calculations in areas with significant plastic strain. The approach has been used to model the three-dimensional crack propagation from internal cavity until its occurrence on the outer surface in non-continuous filletwelded joint. It is shown that the life scatter of the weld joint is affected by the crack nucleation stage. The results of life calculation accounting for the initial material inhomogeneity and obtained crack front evolution are in good agreement with the published experimental data. Keywords: weld joint, fatigue, damage accumulation, fatigue crack, FEM, microstructure, life scatter. 2. Niemi, E. Structural stress approach to fatigue analysis of welded components. Designer’s Guide (IIW Doc. XIII-WG3-06-99). 2000. 3. Hobbacher, A. Recommendations for fatigue design of welded joints and components (IIW Doc. XIII-2151r1-07/XV-1254r1-07). 2007. 5. Frank, K.H., & Fisher, J.W. Fatigue strength of fillet welded cruciform joints. Journal of the Structural Division, 1979, 105(9), 1727–1740. 6. Doshi, K., & Vhanmane, S. Probabilistic fracture mechanics based fatigue evaluation of ship structural details. Ocean Engineering, 2013, 61, 26–38. 7. Marquis, G. Failure modes and fatigue strength of improved HSS welds. Engineering Fracture Mechanics, 2010, 77(11), 2051–2062. fatigue crack growth. Engineering Fracture Mechanics, 1981, 14(1), 59–89. under variable amplitude loading. 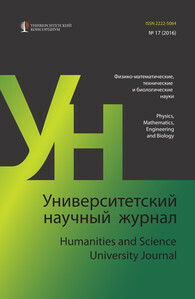 International Journal of Fatigue, 2012, 39, 68–74. of Basic Engineering, 1963, 85(4), 528–533. growth data. Engineering Fracture Mechanics, 2015, 142, 21–49. structures. International Journal of Fatigue, 2012, 38, 108–117. Journal of Fatigue, 2010, 32(4), 685–697. behaviour. International Journal of Fracture, 1983, 5(1), 3–14. 22. Petinov, S.V. Fatigue Analysis of Ship Structures. 2003, USA: Backbone Publishing Co.
of Fatigue, 1982, 4(2), 59–67. damage accumulation. Engineering Fracture Mechanics, 1985, 22(4), 697–712. Conference of OMAE, 2004, Houston. разрушения]. 1993, Russia, St.Petersburg: Polytechnic Publ.